There are some recent events which need/deserve blog attention this weekend. However, real life is interfering. That means I am going to Chattanooga this morning for the wedding of my niece. And I do wish her much happiness. The will of the triad of my mother, my sister and her daughter is indeed a mighty thing. So I'm suiting up and going in. UPDATE: In addition to the wedding in Chattanooga, which was a very nice time and my niece was looking even more exceptional than ever, my extended family grew via the wedding (also on the 9th) in Nashville of my brother-in-law, a most excellent fellow who once made me welcome for a long stay in Manhattan, and is one of the newest and bestest songwriters working the Nashville music scene. And his bride is an aspiring screenwriter. So the family kinda doubled in size yesterday. Yay for all of us!! The complete first seasons of two classic TV series arrive finally, and both are must haves. One is fascinating for capturing the high points and the low for a show that started out as a kind of underground oddity and has become an international giant of entertainment. 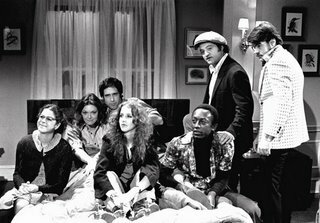 I do recall very well that first night when NBC aired a show they called only "NBC's Saturday Night" with the Not Ready For Prime Time Players. Putting together the entire 1st season of SNL (and other season sets will follow) was too long in arriving. The show has forever changed television. The first few seasons all looked as if it had been made in small nooks and around the edges of the NBC building and it isn't all sheer genius and brilliance. There are clunky skits and odd scenes, but the show was almost a nearly instant hit, a collection of loose cannons wildly taking shots at television and fame, with eclectic music and much self-parody. They were mavericks and outsiders, lumping together college style comedy and outrageously bizarre short films with performers singing musical standards and unknown musicians getting their first national exposure. It was an evolving show too, from the credits design to the structure of opening monologues and the Weekend Update news satire. Hosts, like Richard Pryor, frightened the NBC suits. If you've read any of the so-called histories of the show, you know too that backstage chaos was constant (as was the drug and alcohol). Also new to DVD is the complete first season of "Mission:Impossible" and within that first season are the reasons why the show has remained so popular that almost 40 years later audiences flock to the movies with that title today. Intense action, serious writing and storytelling made with style and rapid-fire editing. The show made a template still being followed by other shows, like "24" and even "Lost." Fans and newcomers alike can see that first season headed by actor Steven Hill as Dan Briggs, as the character of Mr. Phelps played by Peter Graves did not arrive until season two. It was those other actors and characters that made the show most watchable - Martin Landau, Barbara Bain, Greg Morris and Peter Lupus. The scam everyone, including the audience, in spy games and disguises with ultra-cool attitude and backed by a music theme which is still a part of the movie franchise today. Thanks to the intrepid Cinemonkey, I can point you to a web site which has an Advent Calendar where you can open the li'l doors on the calendar for each day of December and read about a movie to encourage a Christmasy mood. Some movies on this list I truly do NOT like however - such as "Home Alone". I thought the whole movie was vapid and dull and, let's be honest, it is also rather sadistic as the Boy Left Alone (not saying his name, sorry) beats and brutalizes some would-be thieves. Just not my idea of 'holiday fun'. Also - they leave off some movies which I think are great films to bring out that holiday cheer. The 2003 comedy "Elf" is infectious fun with Will Ferrell as the overgrown elf with an addiction to syrup and sugar. Another movie worth the time to watch is "A Christmas Story' -- overplayed to death on TV, I can still enjoy it for many reasons -- Scott Farkus fears and the fishnet hose clad female leg lamp, which the Dad calls "a major award" and the Mom secretly destroys. And where are movie versions of "A Christmas Carol"?? 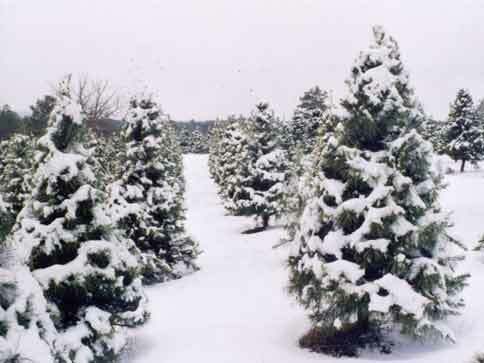 The photo here is via the Tennessee Christmas Tree Growers Association, a site to tell you where you can get the finest in locally grown trees for the holidays. Do you have a holiday movie favorite? Mention must be made of the dangers of the Wii Game Console, which will be under many a Christmas Tree this year. Be careful with the dang thing, people! Actually, the danger is in the controller for the game - seems some people using this wireless controller have gotten so intense during gameplay that they have snapped the wrist-loop on the controller and smashed in their TVs and other household items. A website devoted to such events is here, where they have gotten the attention of Nintendo's executives, who promise a better wrist-loop is on the way. On the way for 2008 -- the long-awaited movie version of the Stephen Kind/Peter Straub fantasy novel "The Talisman." The TNT network and producer Steven Spielberg will create the mini-series! "I would like to win the Robo-reptile because I am a frustrated adult/child that still loves to play with toys. Besides, when I was a youngster it was implied that in my adult years I would be aided by robots and flying cars. I have seen neither & I would love to have just a small sample of what life would be like with a Robo-reptile." 'Nuff said, CarpenterJD. Look for the RoboReptile in your mailbox! My thanks to the DiscoveryStore and the folks at Wowee Toys and with Buzztone marketing for offering readers here this free electronic robotic marvel. And thanks to all the other readers who submitted entries, too! 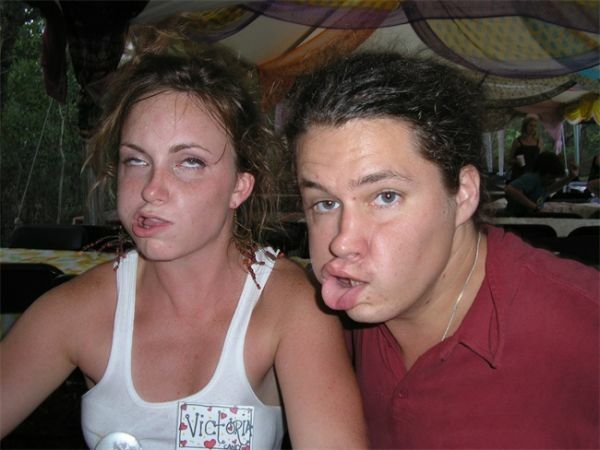 "The restaurant I used to work at fried their frozen crinkle fries in a vat full of trans fats, and they were awesome. Did I eat them every day? I wanted to, but I didn't. Did I eat them once a week? Hell yes, and I wouldn't want it any other way. I can't believe I'm saying this, it's such a cliche, but everything in moderation. Cigarettes should not be banned, even though you shouldn't smoke them regularly. 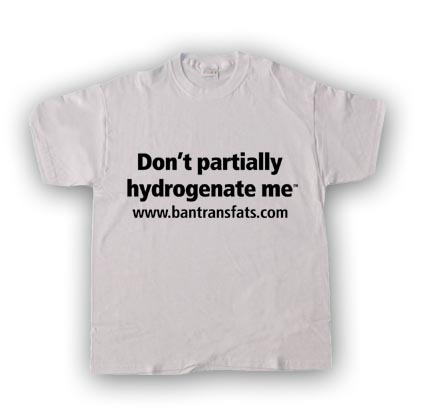 Same goes for trans fats. I can't believe I'm saying this either, but at what point does personal responsibility for one's diet come into play?" Some communities and some corporations and some countries are actively banning artificial trans fat usage. Web sites are devoted to the ban. Apparently, it all started with Crisco. But given the vast number of processed foods, is a label on the side with content ingredients via percentages and small typefaces going to be read by a consumer? If personal choice of foods is to be maintained, will you soon by asked by food service workers, "Would you like an extra hydrogen atom with that??" UPDATE: An Executive Committee meeting of the writers and owners of this blog (me) made a recommendation to alter this contest -- if you'd like to one of these robotic toys, just submit in the comments on this post why you should be the winner. No Poems, no Essays, No Manifestos, No Power Point Presentations. Just 25 words or less on why you should be the winner. TIP: If there is only one entry in the comments as of noon Friday, December 8 -- guess what, you'll be the winner!! More than one entry means winners will be selected by me, for whatever reasons I determine to be valid. As for the 'write a poem' idea, it was not mine. I appreciate very much the efforts on behalf of those offering this Free Christmas Gift from Wowee Toys, but the poem thing just had to go. All week you can register here for a chance to win a free RoboReptile just in time for Christmas. What is a RoboReptile? Check out the video below and read on to see how you can own one! How can you be the winner? Simple. You enter by writing in the comments on this post why you should be the winner of this unique robotic, prehistoric toy. Just put your thoughts down and all entries will be sent to the RoboReptile campaign for use in their advertising campaign. Fame may at last be yours! RoboReptile is a fully-programmable 28-inch long toy with remote controls. It whips it's head and tail around as it searches for food or explores the world around it. It's very reptilian face has mouthful of rubber teeth and can jump, lunge, hop on it's rear feet and has infared sensors to see and sonic sensors which make it respond to the sounds around it. Oh and it is a hungry, aggressive critter. The remote has multiple functions, allowing you to "feed" it, guide it around a room, set it on guard mode and even a volume control for it's roaring and snarling. It also comes with a hood to slip over it's head so you can get some rest from time to time too. Explore more about the RoboReptile here at the Discovery Store. And again, to enter, just leave in the comments on this post why you'd be the perfect owner, or how your home needs a predatory robot. It's up to you! You can put entries here up until noon EST Friday, December 8th and I'll post the winner's name and poem later Friday afternoon. PLEASE: entries must include an email address so I can contact you and have RoboReptile shipped directly to your home. If you have any questions, I'll be happy to answer those as well. The toy is NOT recommended for children under the age of 8. Children over the age of 8, such as myself, will love it. A dizzy collection of rare (or maybe just forgotten) Christmas music MP3s can be found at Check The Cool Wax, which includes merry tunes from Tex Ritter, Pee-Wee Herman, a Batman/Superman/Wonder Woman Christmas caper, Liberace's dramatic re-telling of 'Twas The Night Before Christmas, links to sites so you can find that fabled favorite of your Christmas Past and enough odd TV and rare albums to satisfy everyone. Christmas special on TV are an American combo as good as Egg and Nog (and other ingredients). What other seasonal event could have ever brought together Bing Crosby and David Bowie? 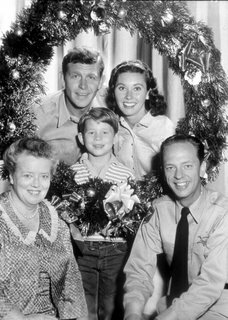 A TV Christmas episode is mandatory broadcasting. Vast collections of music and personal videos await you in the Galaxy of YouTube, as well. This compilation of Christmas specials from The Simpsons is one of my favorites. Includes unaired version of Bart's Christmas Rap. The dog was watching "White Christmas" the other night. I took it for a sign. It's a sign of a 21st century life - all new and fancy and rich with ways to cross over through the media looking glass and poke around like casual citizen scientists in a new frontier. Here are two discoveries I made as the dog's tounge lolled at Rosemary Clooney and Bing Croby. 1.) Jowlers - Where Distortion is Cause For Celebration. There's plenty of pictures and a how-to guide. I'm thinking this is the way to craft a Christmas email this year. A Sample? 2.) Peep-Jousting. We should decide wars and elections this way, perhaps introduce it to the Middle East. Seems as likely to succeed as current efforts. Explanation: Three things are neeeded - Peeps, Toothpicks and A Microwave. Explore here. The former mayor pled guilty to 233 counts on charges related to the voting fraud fiasco in 2004 in the town of Appalachia. I first mentioned the case earlier this year. A host of charges emerged during the presentation of the case, including tampering with absentee ballots and trading bags of pork rinds for votes. The Kingsport-Times News has a wrap-up of the case here. Look like just about all those involved in an attempted grab for power in the town of Appalachia have all confessed to their crimes. Former mayor Ben Cooper's attorney, Patty Church, told the press her client was no political kingpin, however. "Cooper was "not really a Boss Hogg, and his 'kingdom' was more like Larry, Curly and Moe," she said of a conspiracy that unraveled after a voter complained that she was not allowed to vote at the polls, having been informed she had already voted by absentee ballot. The voter knew otherwise." Cooper faces a possible 21 months in jail and over $80,000 in court costs.